That seems to be the question directed at me lately and I am so thankful for the people in my life who care about me enough to ask. I’m sorry to say that I have passively replied to it with a “Things are going good! Looking forward to spring.” answer and changed the subject. The truth is I haven’t really felt like talking about infertility, TTC, and Me lately. Life-After-IVF is such a different pace with less updates and sometimes the updates that I do have feel so personal. (I know that sounds funny coming from the girl who has a blog.) When we were in an IVF cycle, I knew exactly what was going on, what was next, what we could tentatively expect and how you could specifically pray. Now that I am not going into the doctor every 2 days, I don’t know what the next week will hold. Pushing me for more answers just makes me shrug because I don’t know what to say. Do you want me to start talking to you about my cervical mucus and how often we are baby-dancing? I didn’t think so. But I do have a little update. No, I am not pregnant. We have just hit another little road bump, but one that will hopefully bring us some answers. So what’s a laparoscopy and hysteroscopy? Well, under general anesthesia at a surgery center, my doctor is going to go into my body through my belly button, cervix and a few other belly incisions, to get a live look at most of my organs. The ultrasounds we have done in the past can only show us so much in black and white. The laparoscopy will be able to use cameras to see everything as is. Because of the pain and the unknowns, we will be doing a broader organ assessment than necessarily typical of someone struggling with infertility. My doctor will be able to go all the way up to the gall bladder duct (I had my gall bladder removed in 2008), then follow down and check on my liver, bowels, intestines, appendix, pancreas, uterus, ovaries, and fallopian tubes. She will be able to biopsy anything that looks suspicious (God-willing that is nothing), as well as flush out both tubes to ensure there is no blockages since we last checked in 2010. (Hey, a lot has happened since 2010! Anything is possible.) She will also be able to remove some cysts that lurk thanks to PCOS and if there is anything else visible and fixable (like adhesions, polyps, fibroids or infections) take care of it at that time (typically done with a laser). Thanks to doing the hysteroscopy at the same time, we will be able to get a good look at both the inside and outside of the uterus. There truly could be such a wide variety of issues going on that I have tried to remove myself from Google until we know more. I hope and pray that it is nothing serious. The surgery date is being firmed up in the next few days and it looks like it will be scheduled for the first week of April. What’s ahead? I wish I had more answers for you. While this surgery will be able to look at my reproductive organs, the primary reason we are going through it is to diagnosis if there is anything more serious going on. It’s difficult to figure out what’s “normal” given all that my body has gone through the last few years. At times, pain can be evidence that something in your body is changing. It may be a good thing! Both Josh and I, as well as our doctor, feels that it’s better for everyone’s peace of mind to just know if it’s anything serious and be as proactive as possible to get on top of whatever the issue may be. So, the answer to your kindly asked questions is still somewhat unknown, but thankfully I will know more in a few weeks. I promise that if there are any updates, changes in plans, news, or progress made in the infertility department, I will certainly let you know. In the meantime, try not to press me for details about “what’s next” for us because truly, I am not sure. If I’m being honest, that question (Now what are you doing to try to have a baby?) can make me feel like we need to be doing something else other than waiting on God’s timing, as we both feel that He has us holding off on another IVF cycle at this time. Our biggest hurdle right now is getting through this surgery, possible running a few biopsies and checking out my organs, cleaning a few things up and continuing to trust that God is in control of all of this. I will let you all know the exact surgery date soon so you can be praying for us during it. I feel like most of my hurdles in the last few years have been primarily mental – I mean, granted, there have been other surgeries, but the mental part of the game has been so predominant that the physical side effects have been easier to embrace. I feel like the physical part of this surgery is a little heavier than the others so ask for prayers for a quick recovery (a week or two to get back on my feet, possibly a little longer to feel 100% depending on what they do while they are in there), as well as all of the pieces that go along with surgery (anesthesia, multiple incisions, internal healing) to go smoothly. Am I anxious about it? Honestly yes, at times. But it’s at the point where I just want some answers. Will it help my fertility? Possibly. But this isn’t an optional surgery to increase my fertility, it’s a diagnostic surgery to try to figure out what’s going on with my insides. And whenever I start to get a little nervous about these unknowns, I always manage to come across some words that instantly calm me down. One line that has been echoing in my heart lately is a quote from Samuel Rutherford – “Trust God’s Word and His power more than you trust your own feelings or experiences.” This whole time in my life has been an opportunity to walk by faith, not by sight, and so we trust and hand it over to Him. Truly, thanks for asking how we are doing. Consider this a mass update and if we are close, I am so sorry that I wasn’t able to share this with you in a more personal way. But I genuinely appreciate your care and kindness and value your support more than you know! Oh and PS – let’s celebrate another shorter cycle! We have gone from 63 days, to 41 days, to …. 37 days. Making progress! :) Praise God! 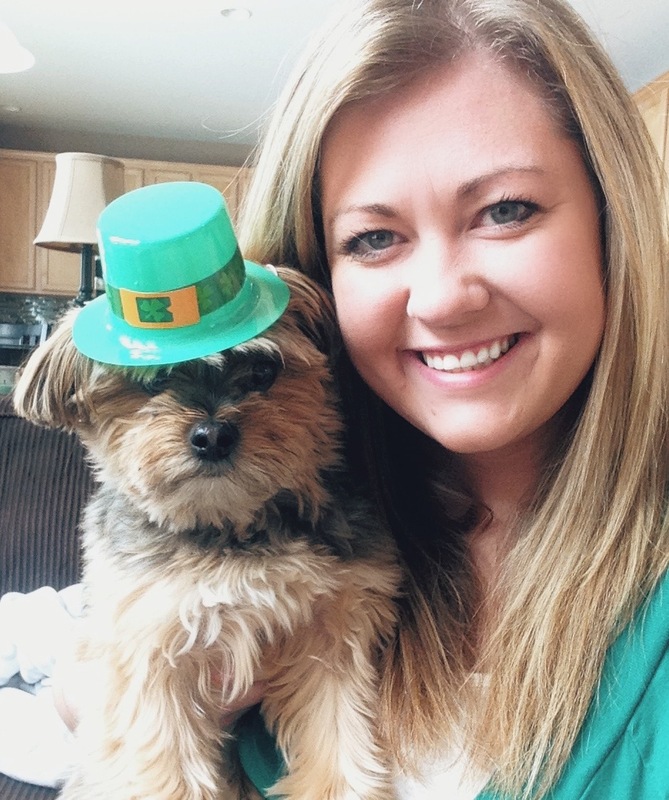 Me and my little leprechaun, who is obviously thrilled with her hat. Thank you for sharing this with us Chelsea. I will be praying for wisdom for the doctors and that your surgery would be swift and that your recovery will be easy. I’m praying for Josh as he becomes Mr.Nurse to take care of you again. Most of all before then I really hope you enjoy your time with family and have an absolutely wonderful vacation. I know how you feel as you experience this dry what’s next/unknown season. During my season of waiting from IUI to IVF it was hard but my faith grew so much and God blessed me more than I deserved. It’s evident to me that he’s working in your life as well. Continue to trust him and enjoy his peace. I love you sweet friend! Thank you so much Charity! I’m so blessed by your friendship, prayers, and encouragement. Love you and thank you for reading and being there for me!! Praying for you guys too as you progress forward on your own journey!! Xoxox! Thanks for the update, Chelsea. I will def be praying and keeping my eyes open for you updates. God has this! No fear! Thanks so much for caring and praying! You’re so right! Thank The Lord (literally) that He is in all of this! Good luck!! I hop you can get some answers! Happy to hear your cycles are shortning, that’s good! I know it’s hard when you’re in that lull where nothing seems to be progressing. Take care! Thanks so much! One day at a time! :) xoxo! I had a very similar surgery done back in 2008 when I was first beginning fertility treatments. I was VERY sore for about 3 days, but probably back to 100% normal in about a week. I’ll be thinking of you and praying for a good outcome for you. I remember that we used to get the, “Sooo, how are you doing?” question a lot and while I’m pretty open on my blog, it’s harder for me to be so open in person. I’m still thankful for an outlet in my life! I had a lap and it was not that bad. I have unexplained infertility and the worst part was when they told me they did not find anything. I was really hoping the would find the source of my infertility. I could then fix the problem or accept I can’t get pregnant and explore other options. Thanks for sharing your experience Caroline! I’m so glad that yours wasn’t awful but I’m really sorry that they didn’t fine more for you. My heart and thoughts are with you as you battle on!! I think sometimes the most significant changes occur so subtly, it feels like nothing is happening at all. From my viewpoint, you are the busiest little not-busy person I know! You’re doing a great job! Awww I love that encouragement and that reminder that a lot IS happening even though its not super busy. Great point Nina and a perspective I needed! Thank you! !